In anticipation of her upcoming recording of jazzy renditions of standards and beyond, Jenny Gear presents an evening of music featuring Bill Brennan, Scott Mansfield, Dave Rowe and Sandy Morris. 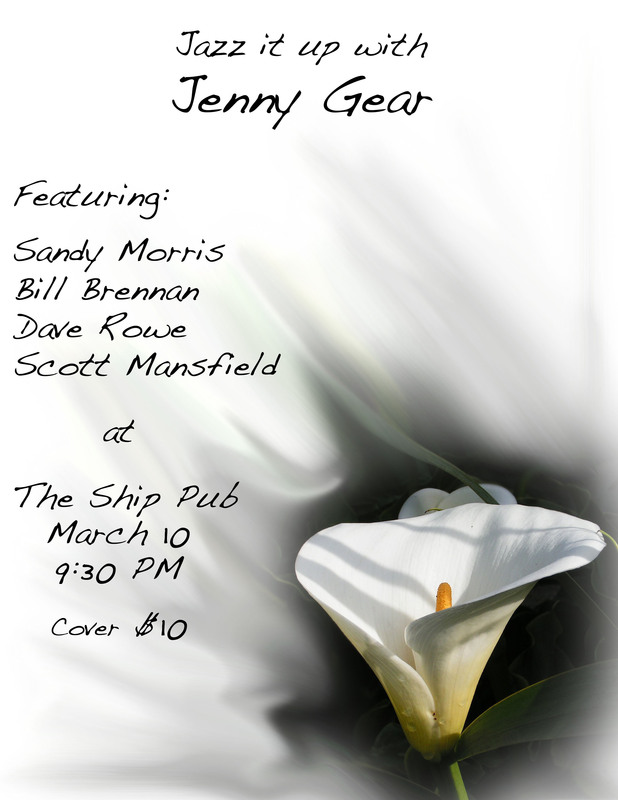 Thursday evening, March 10th at the Ship Pub starting at 9:30, Jenny will sing selections from the great American Songbook including songs of George Gershwin, Henry Mancini, Richard Rogers, Billie Holliday and the music of Tom Waits, Prince and much, much more. This is the first of a series of concerts in preparation for a full length CD based on material from the shows. Cover charge is $10.00 at the door.